It was music fit for the lavish setting. 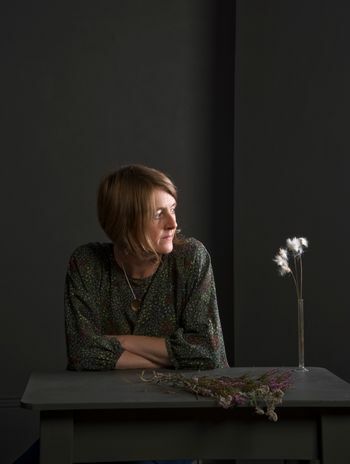 By her own admission, Karine Polwart has not made many visits to the West Midlands to play shows in the past, so the opportunity to bring her current tour to Birmingham Town Hall was too good to turn down. It does not matter where your prior appreciation or awareness of her music sits on the barometer; by the end of the show, you attain the status of a fully-fledged knowledgeable fan. Not only is Karine Polwart the source of many wondrous songs, the background and inspiration to them is enchanting, enlightening and dealt with heaps of guile and craft. Adeptly assisted by a band comprising of her brother Steven on guitars and multi-instrumentalist Inge Thomson, the trio glided through two precious sets full of new songs, older numbers and the odd surprise. At the heart of the content are myths, observations and personal experiences from their Scottish home, a land that has placed Karine Polwart at the heart of the folk scene for many years. The centerpiece of the current tour is the release of the latest album LAWS OF MOTION. By the time Karine mentioned the record via the title track towards the end of the first set, several songs from it had already been enjoyed alongside learning about their origin. Politics has often been a fruitful source for Karine and right from the off we were treated to the inventive piece ‘I Burn But I am Not Consumed’ taking its cue as a response to the 45th President of the United States from the land of his ancestry. Politics with a small ‘p’ plays a part in the song ‘Suitcase’, which draws its inspiration from forced emigration from Eastern Europe to Scotland in 1938 and generally reflecting modern day migration. Most songs from the new album had an informative introduction, so we learned that ‘Cornerstone’ draws on the experience of visiting the Isle of May and ‘Young Man on a Mountain’ recalls her grandfather’s joint ventures on active war service in Italy and a more serene life in the forests of Scotland. Before we leave the new album, a special word for ‘Ophelia’, which was probably the stand out song of the evening and one that launched the second set. Perhaps a song that let its beauty do the talking as no introduction was required. As indicated, Steven Polwart did most of the string work, although Karine did sidestep from her Shruti Box to acoustic guitar on more than one occasion. By far the most intriguing aspect of the sound is the contribution of Inge Thomson. Surrounded by a concoction of percussive, electronic and organic instruments, she came across as a fair distance from the folk purist world to the extent of experimenting with loops alongside more conventional accordion work. However, the soundtrack worked a treat and played the perfect foil to Karine’s beautiful unblemished vocals. It was not all the domain of original material. A song by Sidney Carter, ‘Crow on the Cradle’, can be found on the new album and appeared in the first set, alongside a tribute to Scott Hutchison, the late front man of Scottish rock band Frightened Rabbits, with a cover of ‘Swim Until You Can’t See Land’. You could sense the populist divide between this song and the distinct folk numbers, a trait expanded further later on when the trio launched into a fun, and different version, of the seventies chart topper ‘Video Killed the Radio Star’. Many people leaving a Karine Polwart concert would be entirely justified in celebrating the feathered thread as the stand out moments. In the final throes of the show, Karine recounted the myth of the robin obtaining its red breast before launching into ‘The Robin’, ended the second set with her signature tune ‘King of Birds’ and eventually closed the evening with her own favourite of the species, ‘Follow the Heron’. The splendour of Birmingham Town Hall is never a presence to be under estimated when enjoying a show in the venue. Maybe thoughts do sometimes drift to the need for Birmingham to utilise a smaller theatre-style setting when getting anywhere close to selling out a 900-capacity venue is beyond the pull of an artist. However, any substitute would fall short in the grandeur stakes. Thinking back, Karine Polwart was last seen in concert at the Artrix in nearby Bromsgrove six years ago. In hindsight this was far too long, but enjoying a full two-hour exhibition of inspirational Scottish folk music has started the compensation process. Leaving the venue informed, inspired and fully entertained is all you can ask for from putting your money down.